Mother Noella Marcellino is a Benedictine nun of the Abbey of Regina Laudis in Bethlehem, CT (She earned the title “mother” in 1985). Walled off from outsiders, the abbey encompasses a 360 acre farm complete with bees, cows and hogs, a garden with herbs to make tea, a pottery studio, and a smith shop making the cloistered nuns practically self-sustaining. Mother Noella enrolled at Sarah Lawrence in 1969 and became a cloistered nun a couple years later. After many years of milking the abbey’s cows, she was asked to make the abbey’s cheese in 1977. Mother Noella’s first attempts at cheese were unsuccessful and many of these batches were thrown to the pigs. However, one fortuitous day, at the invitation of the abbess, Lydia Zawislak, a third-generation cheesemaker came from Auvergne and showed Mother Noella a traditional way of making cheese in a wooden barrel. The wooden barrel method was working very well and the F.D.A. was turning a blind eye to the nuns’ method of cheese production until 1985, when 29 fatalities were caused from a Listeria monocytogenes outbreak in Southern California from an unaged raw milk. After the outbreak, Mother Noella was told that she needed to get rid of her wooden cheese barrel and start using a stainless-steel vat. The abbey went above and beyond to comply with the regulation enforcement and four nuns enrolled n a nearby University and received doctorates in key disciplines: microbiology, animal science, plant science, and agronomy. Mother Noella went to the University of Connecticut for microbiology. In 1994, she earned a Fulbright Scholarship to France and a subsequent three year fellowship from the Institut National de la Recherche Agronomique (INRA) to pursue her research. She received her doctorate in Microbiology in the Department of Molecular and Cell Biology at the University of Connecticut in 2003. Her original objective came from an observation she had made from her own cheese aging facility – Mother Noella wanted to study the history and ecology of French cheese caves. This topic proved too vast so she narrowed it down to study only one strain of mold – Geotrichum candidum – in French cheese caves. Her new and functional thesis was “The diversity of French fungus-ripened cheeses is due partly to the succession of fungi that colonize the cheese during ripening.” Mother Noella wondered how much the mold varied from one cave to another. She isolated and collected 180 samples from milk, curd, and cheese from farms that produce 11 types of soft and semihard cheese in Normandie, Lorraine, Champagne–Ardenne, Bourgogne, Franche-Comte’, Haute Savoie, and Auvergne (Fig. 1.) Samples were frozen until processed in the laboratory – where Mother Noella spent the next two years at the bench characterizing the molds with genetic and biochemical tests. Geotrichum candidum is a fungus that colonizes nearly all fungal surface-ripened cheese during the early stages of ripening and Mother Noella’s study revealed that there is an enormous diversity of Geotrichum candidum. Of the 180 samples, sixty-four Geotrichum candidum isolates were characterized. High genetic diversity of G. candidum was found even within the same cheesemaking regions and strains did not group according to region. On soft cheeses, such as Camembert, and semihard cheeses, such as St. Nectaire and Reblochon, the biochemical attributes of G. candidum impact the course of cheese ripening. Yeast-like colony morphology predominated in Reblochon, while all of the strains isolated from St. Nectaire were filamentous. On some cheeses, like St. Marcellin, it is responsible for the appearance of the cheese, imparting a uniform, white, velvety coat to the surface (Marcellino). 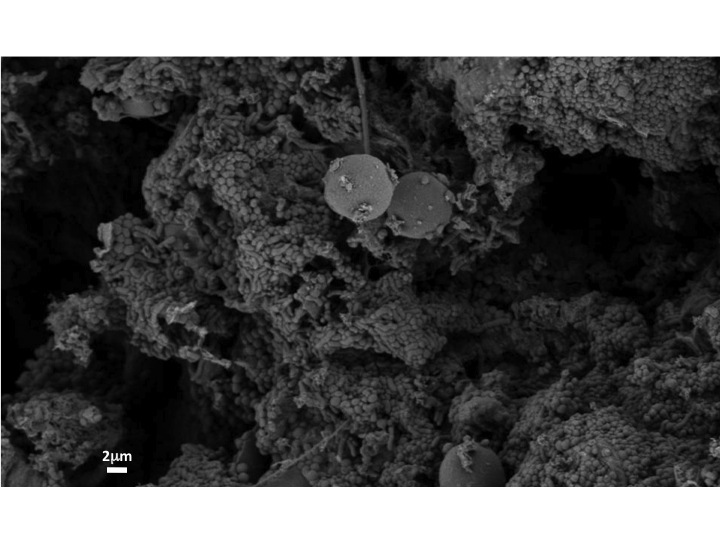 After colonizing a cheese, lipases and proteases of G. candidum release fatty acids and peptides that can be metabolized by ensuing microbial populations and that contribute to the development of distinctive flavors and other qualities (Marcellino). However, not all strains are beneficial for cheese – Some less desireable strains create unstable rinds that disintegrate when the young cheeses are flipped during aging. Other strains can lead to irregular growth of fungal populations or may provide the opportunity for contamination by blue molds or Mucor spp.. However, some strains of G. candidum can inhibit the growth and/or sporulation of Mucor spp. (Noella). The population density of strains also has an effect on covering gas exchange facilities across the surface of the cheese. 1. Some strain groups were found within the same cheesemaking facility at different times during ripening. Four closely related strains (GC63, GC59, GC64, and GC60 – at the top of Fig. 3) were isolated from two 35-day-old Reblochon cheeses and two 7-day-old Tomme de Savoie cheeses produced and ripened in the same facility in Annecy, Haute Savoie. A similarly diverse set of five strains was isolated from a farm that was located 19km from Annecy and that also produced Reblochon. 2. Similar diversity was found among strains isolated from milk and curd of the same facilities showed 90% or greater similarity and had similar morphology and carbon assimilation profiles. 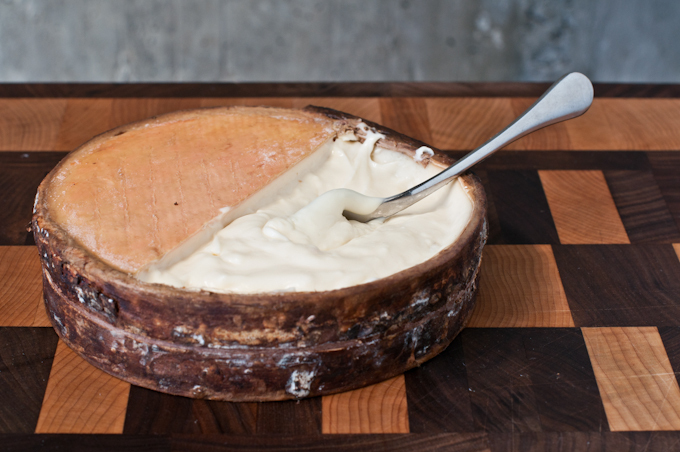 For example, GC84 and GC82 from Epoisses and GC45 and GC43 from Mont d’Or were isolated from the milk and curd, respectively, of the same facility. According to Fig. 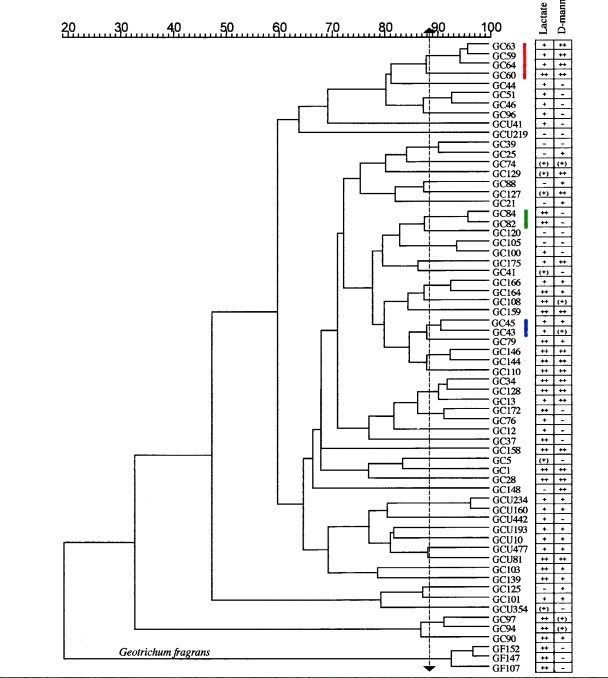 3, these strains couples are highly related but the sets are rather far removed. However, this observation suggests that a strain can be followed during the cheesemaking process. The results from Mother Noella’s research team suggest that cheesemaking techniques play a role in strain selection and that French cheesemakers have optimized production techniques to select empirically for native strains of microorganisms that produce the best cheeses. Interestingly, centuries-old cheesemaking methods are not based on a thorough knowledge microbiology, yet much of the flavor development associated with cheese ripening is due to microbial activity which causes the diversity of various cheeses and their aromas, textures, and flavors. Many microbial populations that have developed in primitive cheesemaking environments remain largely uncharacterized. The colored lines correspond to the colored text (strains mentioned) within the blog. A documentary film about this journey, The Cheese Nun: Sister Noella’s Voyage of Discovery, produced by the Paris American Television Company, has been shown in film festivals and aired nationally on PBS Television in 2006. Sister Noella was honored with the reception of the International Academy of Gastronomy’s Grand Prix de la Science de Alimentation in 2005, and the French Food Spirit Award in Scientific Advancement, given in the French Senate, Paris, in 2003. She was a scholar-in-residence at the 2011 American Cheese Society Conference in Montreal. Categories: Cheese Scientist Profile | Tags: microbiology, mold | Permalink.